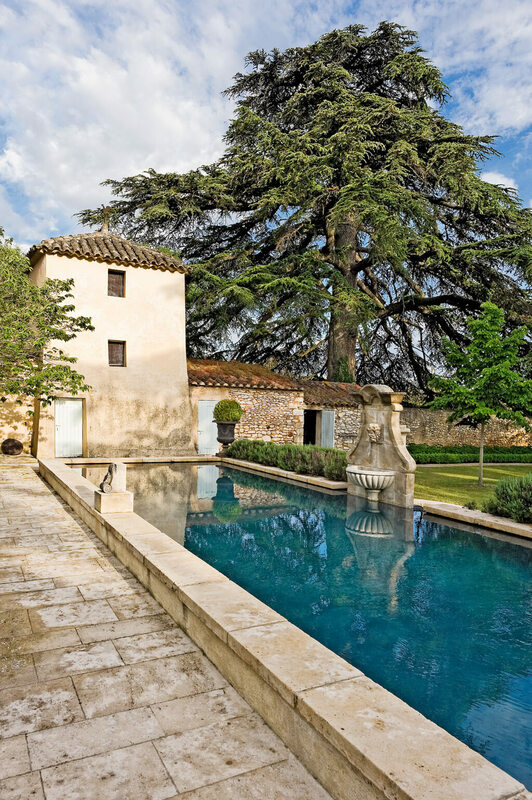 Just wait until you feast your eyes on this country house in the South of France! 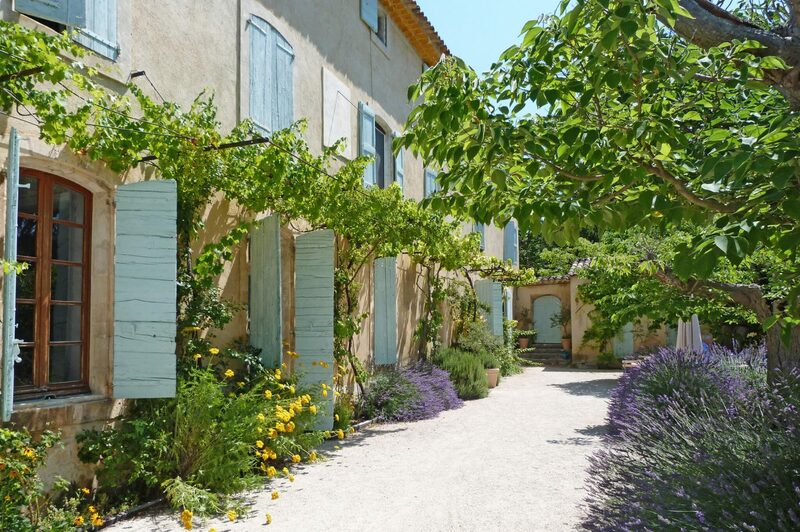 Villa St-Saturnin is a Provence luxury rental offered by Haven In – a firm with the dreamiest vacation properties. 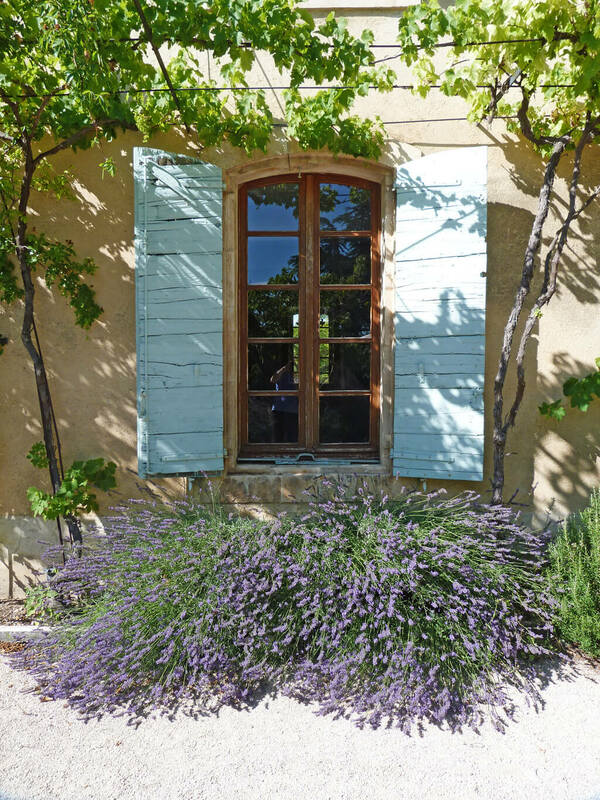 French lavender and the most romantically rustic green shutters! Provence Villa: Timeless & Tranquil Design. Elegant Provençal home, European farmhouse, French farmhouse, and French country design inspiration from Villa St-Saturnin. Photo: Haven In. South of France country house (a converted convent!) luxury vacation rental in the heart of Luberon National Park near Apt. Certainly lovely indeed! Thank you so much for the encouragement and kindness lavished on me since I shared my relief in finding answers for the illness I am experiencing. I appreciate all the tips and prayers. I shared a video in my last post of a haunting chant by Anuna which has kept me company for the past month. 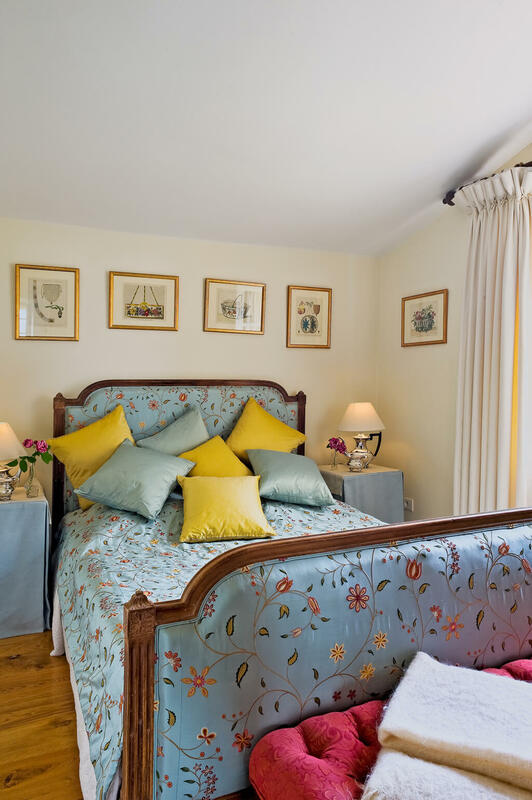 This elegant French country home sleeps 12 with its six bedrooms and is located in the heart of the Luberon National Park (45 minutes from Avignon; one hour from historic Aix-en-Provence). 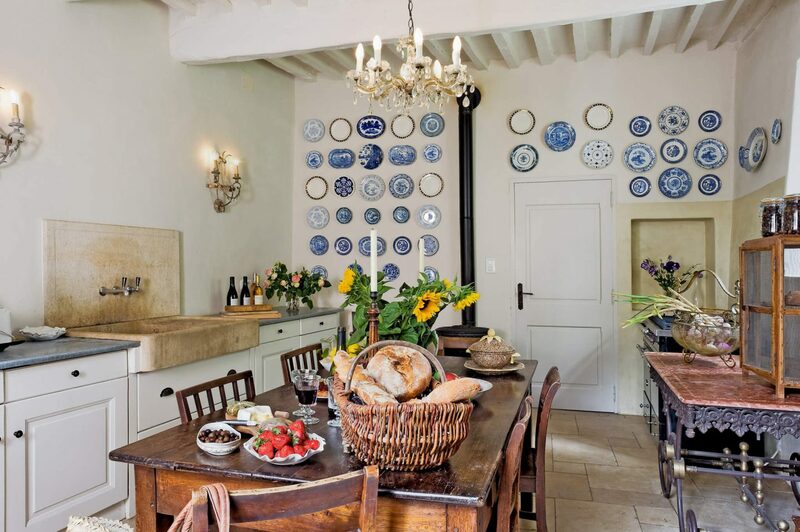 The home is a 15 minute walk from the medieval village of St-Saturnin-les-Apt, a traditional Provençal village that has retained its authentic charm. Could the color palette be more exquisite? Provence Villa: Timeless & Tranquil Design. Elegant Provençal home, European farmhouse, French farmhouse, and French country design inspiration from Villa St-Saturnin. Photo: Haven In. South of France country house (a converted convent!) 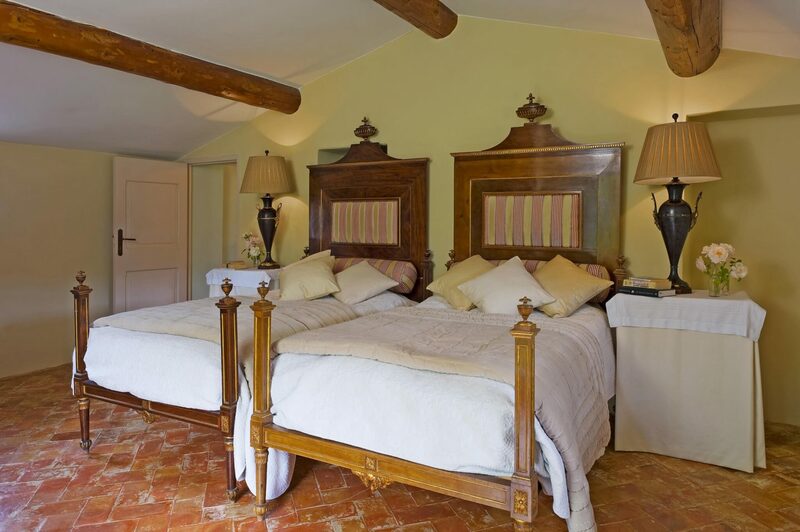 luxury vacation rental in the heart of Luberon National Park near Apt. Certainly lovely indeed! Breathtaking facade. Provence Villa: Timeless & Tranquil Design. Elegant Provençal home, European farmhouse, French farmhouse, and French country design inspiration from Villa St-Saturnin. Photo: Haven In. South of France country house (a converted convent!) luxury vacation rental in the heart of Luberon National Park near Apt. Certainly lovely indeed! What a fantasy backdrop for a Provençal vacation with family or friends! Vivid yellow blooms outside. Provence Villa: Timeless & Tranquil Design. Elegant Provençal home, European farmhouse, French farmhouse, and French country design inspiration from Villa St-Saturnin. Photo: Haven In. South of France country house (a converted convent!) luxury vacation rental in the heart of Luberon National Park near Apt. Certainly lovely indeed! 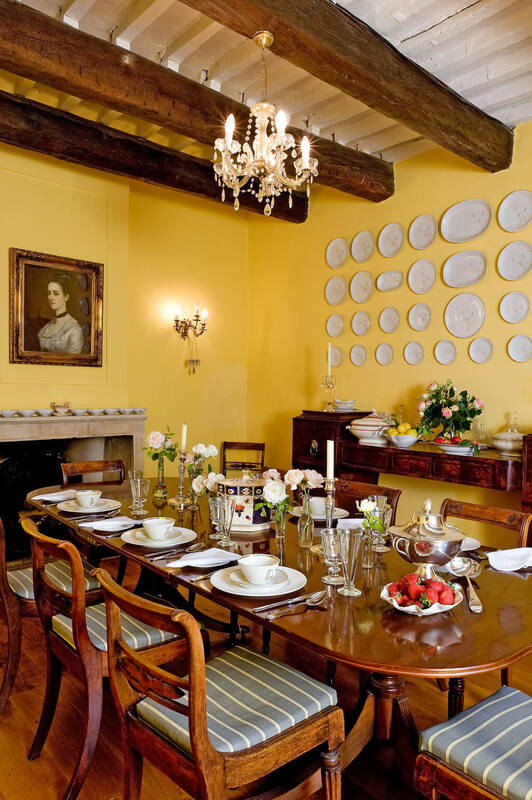 The furniture is a thoughtful collection of French and English antiques, and the architectural details throughout are stunning. Living areas are spread over three floors. 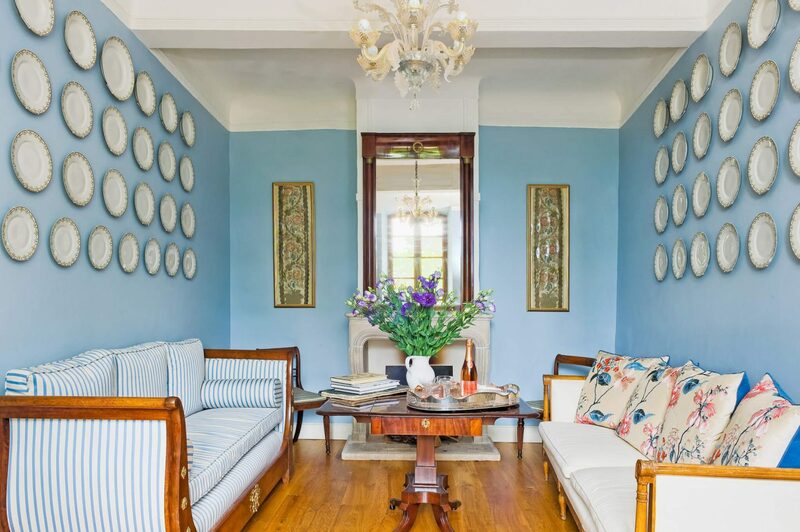 A classic reception parlor is found on the ground floor, along with a formal dining room, a large French country kitchen, and a casual TV room. Don’t you want to rush to the antique shop for blue plates!?! Provence Villa: Timeless & Tranquil Design. Elegant Provençal home, European farmhouse, French farmhouse, and French country design inspiration from Villa St-Saturnin. Photo: Haven In. South of France country house (a converted convent!) luxury vacation rental in the heart of Luberon National Park near Apt. Certainly lovely indeed! Six bedrooms occupy the top two floors, including a studio with private kitchen available for additional visitors. 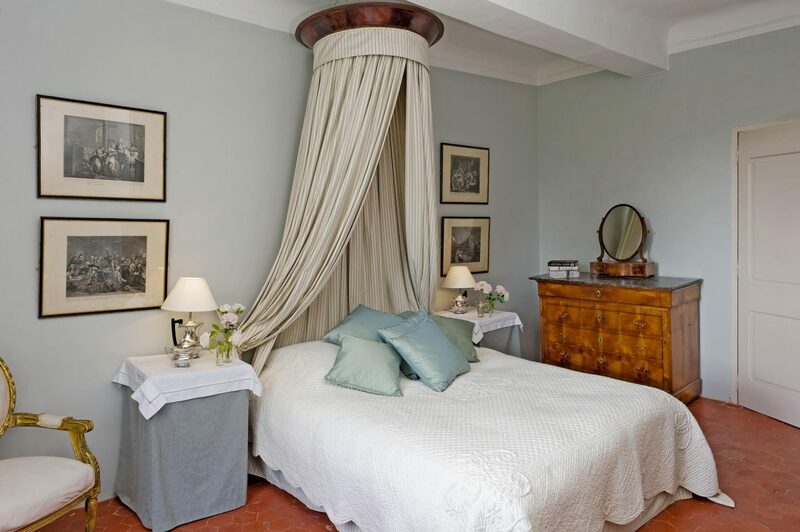 Each bedroom and bathroom is decorated in its own unique style, with charming canopies, luxurious sleigh beds, claw foot bathtubs and sinks set in wrought iron powder tables. 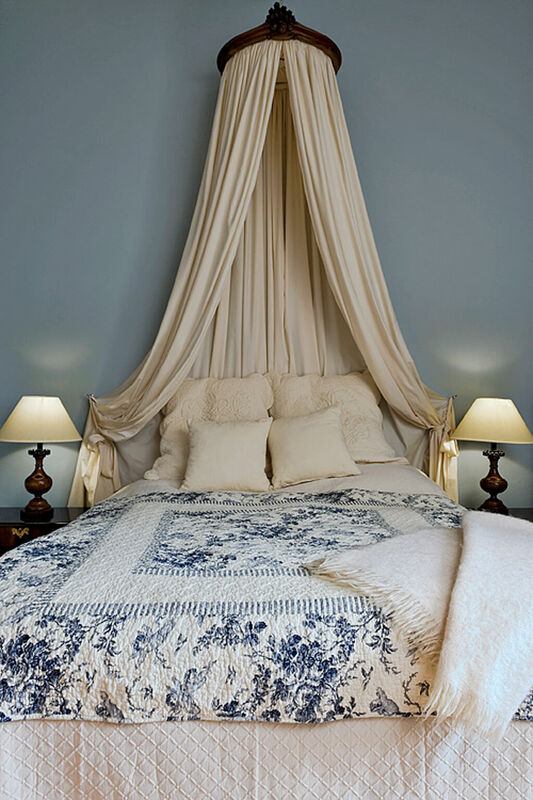 Tone on tone in a gorgeous restful white bedroom. Provence Villa: Timeless & Tranquil Design. Elegant Provençal home, European farmhouse, French farmhouse, and French country design inspiration from Villa St-Saturnin. Photo: Haven In. South of France country house (a converted convent!) luxury vacation rental in the heart of Luberon National Park near Apt. Certainly lovely indeed! Another nearby destination is the village of Apt, a seven minute drive from Villa St-Saturnin. Apt is a bustling town with an enormous Saturday market full of amazing produce, spices, cheese, bread, wine, and lovely Provence finds. Discover interesting boutiques, cafes, restaurants, and a picturesque cobbled pedestrian city center to explore. 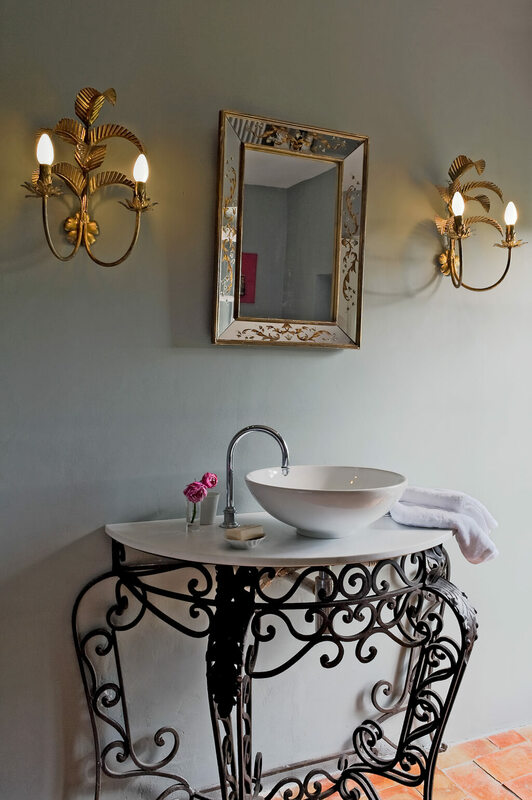 An iron console base holds a vessel sink. Provence Villa: Timeless & Tranquil Design. Elegant Provençal home, European farmhouse, French farmhouse, and French country design inspiration from Villa St-Saturnin. Photo: Haven In. South of France country house (a converted convent!) luxury vacation rental in the heart of Luberon National Park near Apt. Certainly lovely indeed! Poolside. Provence Villa: Timeless & Tranquil Design. 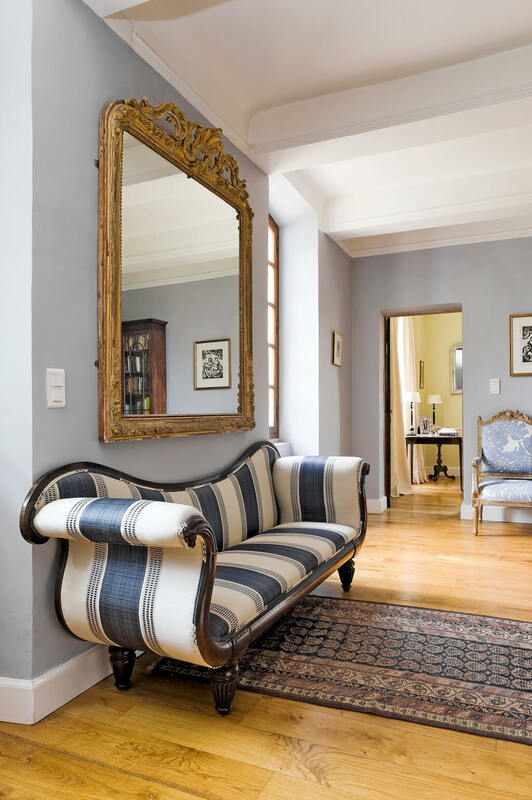 Elegant Provençal home, European farmhouse, French farmhouse, and French country design inspiration from Villa St-Saturnin. Photo: Haven In. South of France country house (a converted convent!) luxury vacation rental in the heart of Luberon National Park near Apt. Certainly lovely indeed! Tranquil shades of French blue. Provence Villa: Timeless & Tranquil Design. Elegant Provençal home, European farmhouse, French farmhouse, and French country design inspiration from Villa St-Saturnin. Photo: Haven In. South of France country house (a converted convent!) luxury vacation rental in the heart of Luberon National Park near Apt. Certainly lovely indeed! 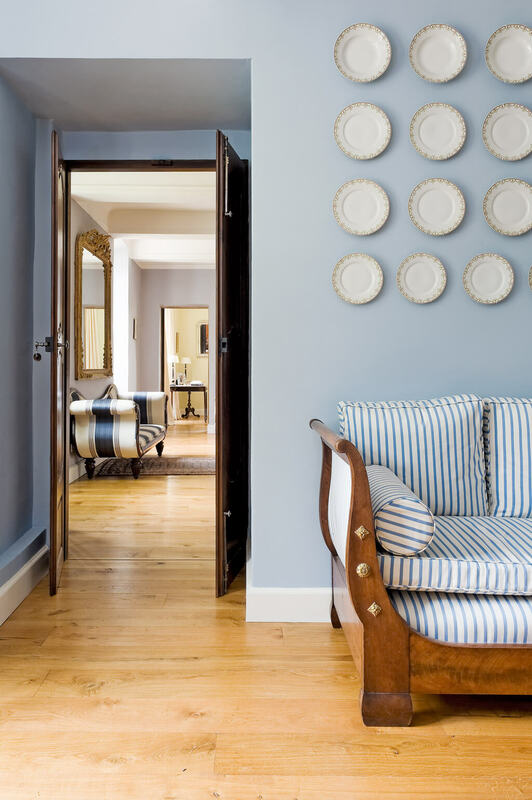 A blue parlor with classic French interior design. Provence Villa: Timeless & Tranquil Design. Elegant Provençal home, European farmhouse, French farmhouse, and French country design inspiration from Villa St-Saturnin. Photo: Haven In. South of France country house (a converted convent!) luxury vacation rental in the heart of Luberon National Park near Apt. Certainly lovely indeed! Provence Villa: Timeless & Tranquil Design. Elegant Provençal home, European farmhouse, French farmhouse, and French country design inspiration from Villa St-Saturnin. Photo: Haven In. South of France country house (a converted convent!) luxury vacation rental in the heart of Luberon National Park near Apt. Certainly lovely indeed! 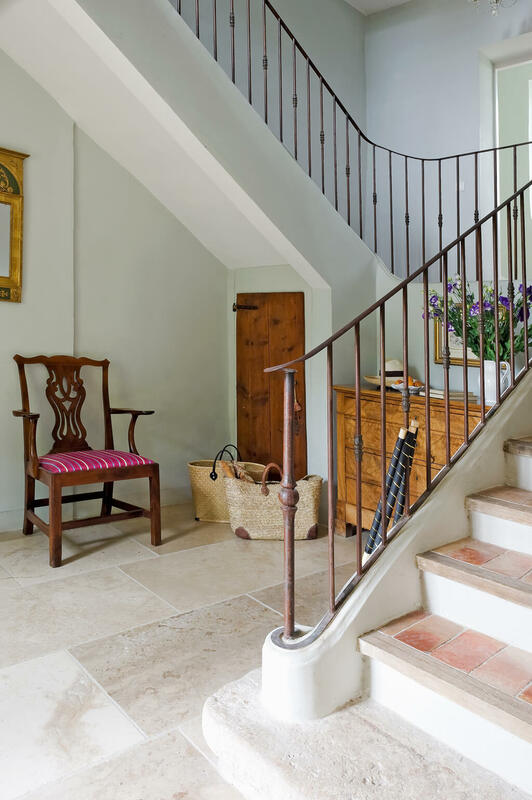 Delicate iron railings and rustic terracotta tiled flooring and stairs. Provence Villa: Timeless & Tranquil Design. Elegant Provençal home, European farmhouse, French farmhouse, and French country design inspiration from Villa St-Saturnin. Photo: Haven In. South of France country house (a converted convent!) luxury vacation rental in the heart of Luberon National Park near Apt. Certainly lovely indeed! Stunning architectural details throughout. Provence Villa: Timeless & Tranquil Design. Elegant Provençal home, European farmhouse, French farmhouse, and French country design inspiration from Villa St-Saturnin. Photo: Haven In. South of France country house (a converted convent!) luxury vacation rental in the heart of Luberon National Park near Apt. Certainly lovely indeed! 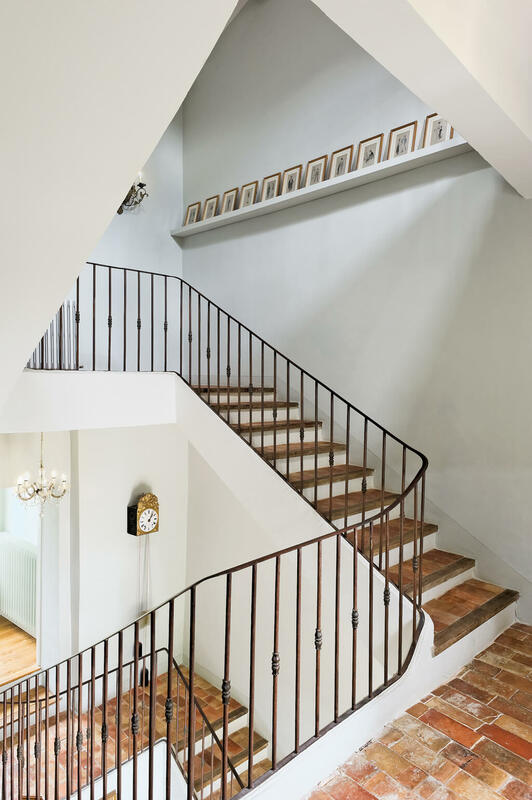 Simple sophistication and staircase loveliness. Provence Villa: Timeless & Tranquil Design. Elegant Provençal home, European farmhouse, French farmhouse, and French country design inspiration from Villa St-Saturnin. Photo: Haven In. South of France country house (a converted convent!) luxury vacation rental in the heart of Luberon National Park near Apt. Certainly lovely indeed! 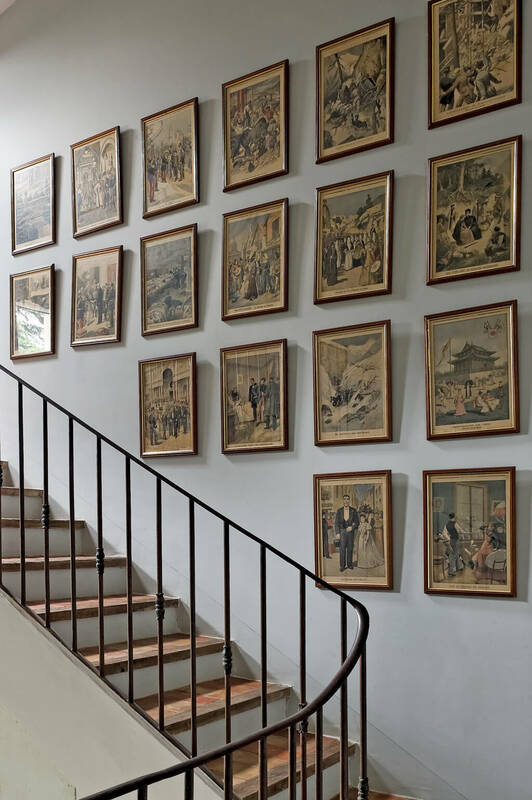 A staircase gallery. Provence Villa: Timeless & Tranquil Design. Elegant Provençal home, European farmhouse, French farmhouse, and French country design inspiration from Villa St-Saturnin. Photo: Haven In. South of France country house (a converted convent!) luxury vacation rental in the heart of Luberon National Park near Apt. Certainly lovely indeed! 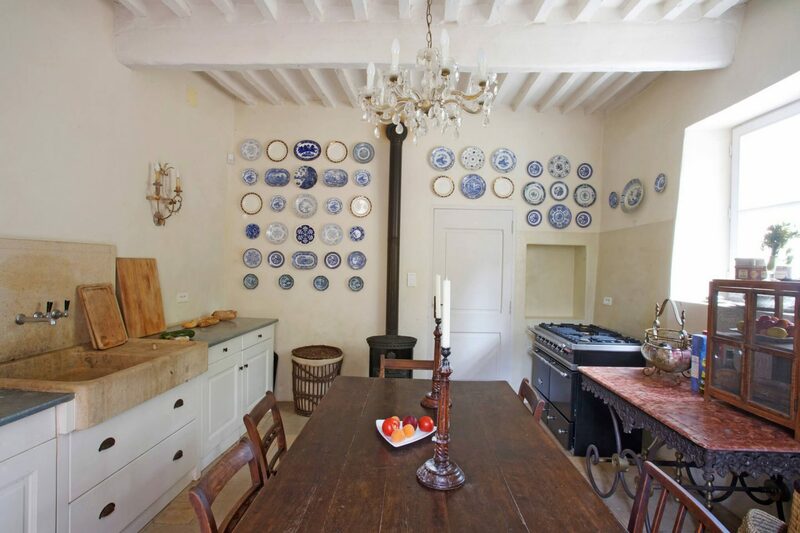 Blue plates massed on a rustic French country kitchen wall. Provence Villa: Timeless & Tranquil Design. Elegant Provençal home, European farmhouse, French farmhouse, and French country design inspiration from Villa St-Saturnin. Photo: Haven In. South of France country house (a converted convent!) luxury vacation rental in the heart of Luberon National Park near Apt. Certainly lovely indeed! 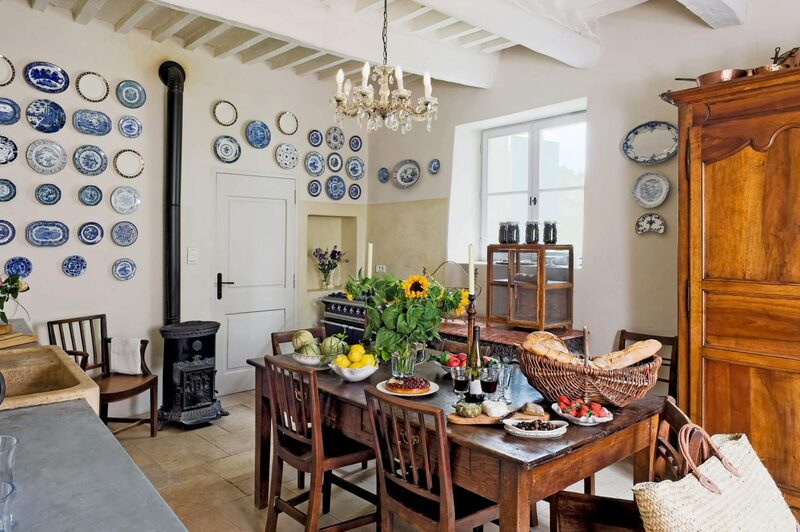 Authentic and rustic details in a French country kitchen. Provence Villa: Timeless & Tranquil Design. Elegant Provençal home, European farmhouse, French farmhouse, and French country design inspiration from Villa St-Saturnin. Photo: Haven In. South of France country house (a converted convent!) luxury vacation rental in the heart of Luberon National Park near Apt. Certainly lovely indeed! Romantic and rustic French kitchen. 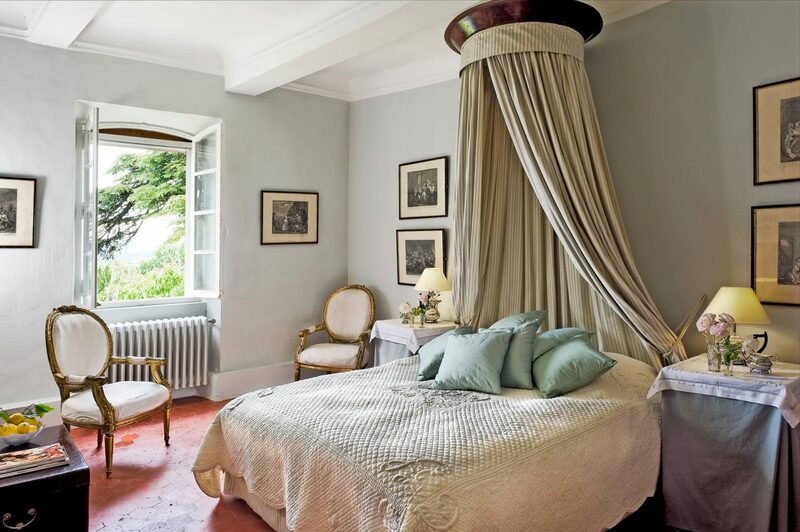 Provence Villa: Timeless & Tranquil Design. Elegant Provençal home, European farmhouse, French farmhouse, and French country design inspiration from Villa St-Saturnin. Photo: Haven In. South of France country house (a converted convent!) luxury vacation rental in the heart of Luberon National Park near Apt. Certainly lovely indeed! 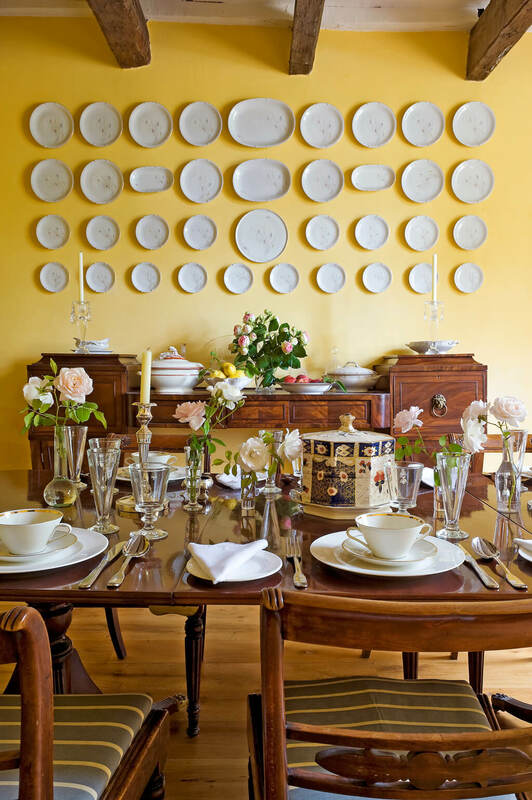 A bold yellow wall color in a traditional French dining room. Provence Villa: Timeless & Tranquil Design. Elegant Provençal home, European farmhouse, French farmhouse, and French country design inspiration from Villa St-Saturnin. Photo: Haven In. South of France country house (a converted convent!) luxury vacation rental in the heart of Luberon National Park near Apt. Certainly lovely indeed! French country dining room. Provence Villa: Timeless & Tranquil Design. Elegant Provençal home, European farmhouse, French farmhouse, and French country design inspiration from Villa St-Saturnin. Photo: Haven In. South of France country house (a converted convent!) luxury vacation rental in the heart of Luberon National Park near Apt. Certainly lovely indeed! Plates massed on a dining roomwall. Provence Villa: Timeless & Tranquil Design. 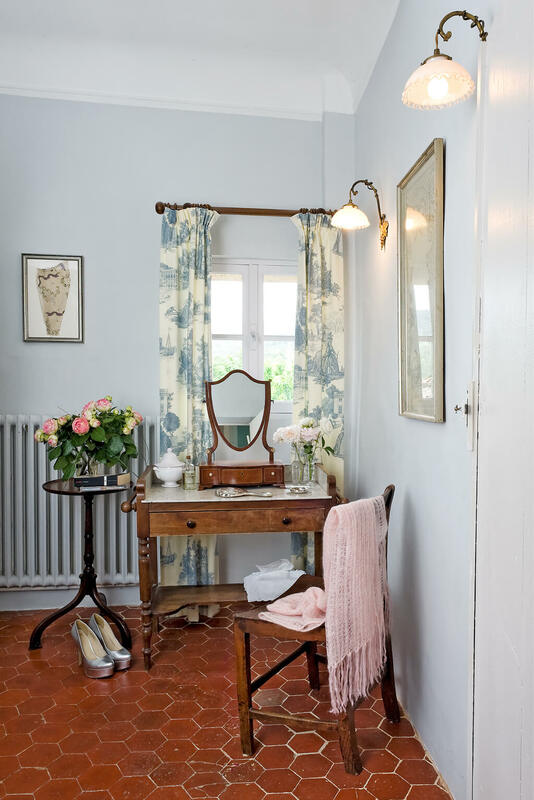 Elegant Provençal home, European farmhouse, French farmhouse, and French country design inspiration from Villa St-Saturnin. Photo: Haven In. South of France country house (a converted convent!) luxury vacation rental in the heart of Luberon National Park near Apt. Certainly lovely indeed! 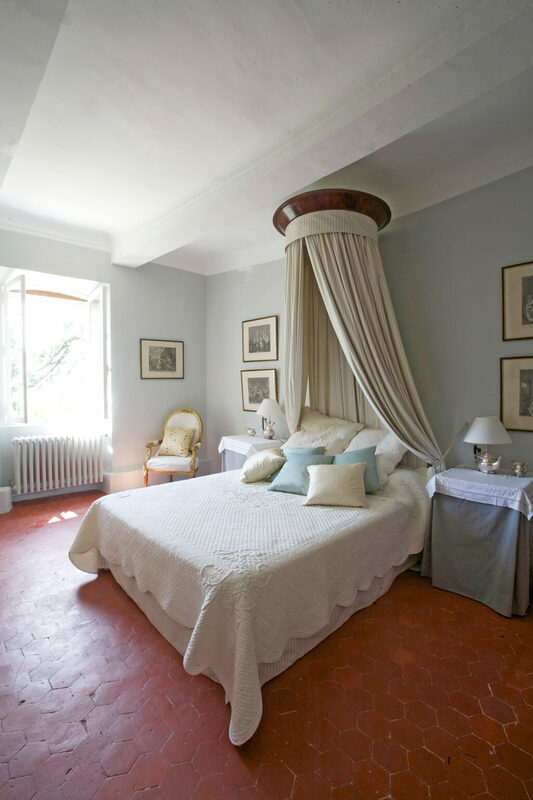 Blue grey walls in a French country bedroom.Provence Villa: Timeless & Tranquil Design. Elegant Provençal home, European farmhouse, French farmhouse, and French country design inspiration from Villa St-Saturnin. Photo: Haven In. South of France country house (a converted convent!) luxury vacation rental in the heart of Luberon National Park near Apt. Certainly lovely indeed! 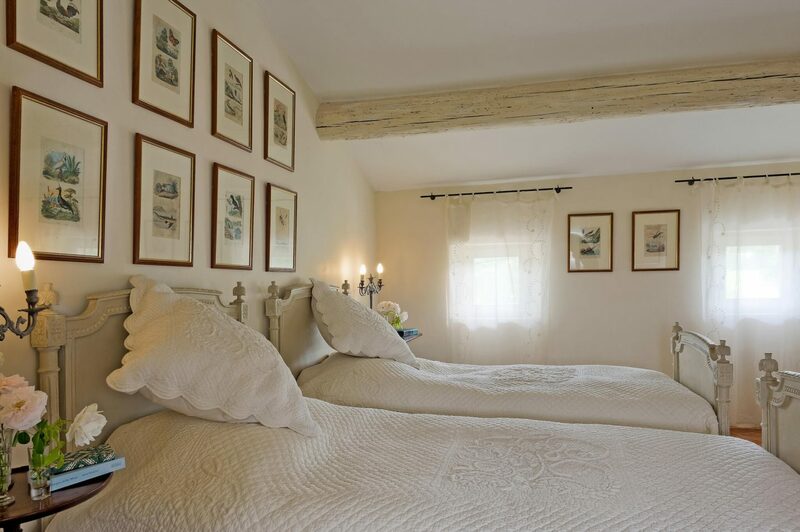 Serene and romantic traditional French country bedroom. Provence Villa: Timeless & Tranquil Design. Elegant Provençal home, European farmhouse, French farmhouse, and French country design inspiration from Villa St-Saturnin. Photo: Haven In. South of France country house (a converted convent!) luxury vacation rental in the heart of Luberon National Park near Apt. Certainly lovely indeed! 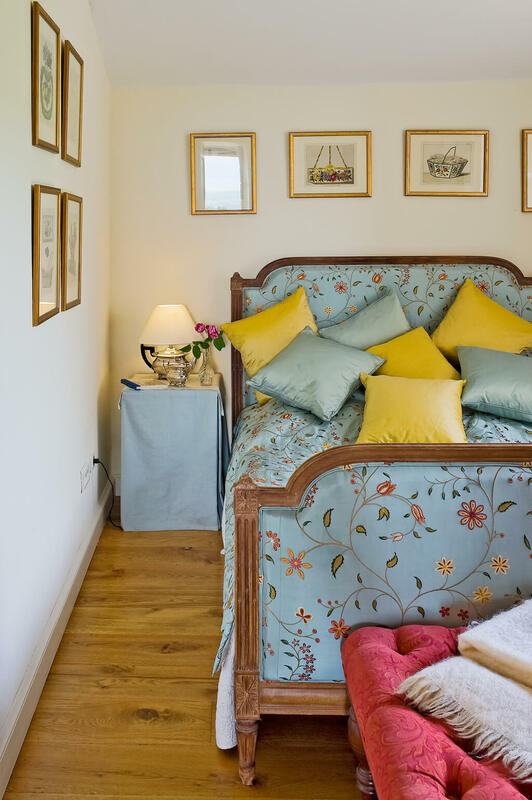 Crewel work on a bed in a French country bedroom. Provence Villa: Timeless & Tranquil Design. 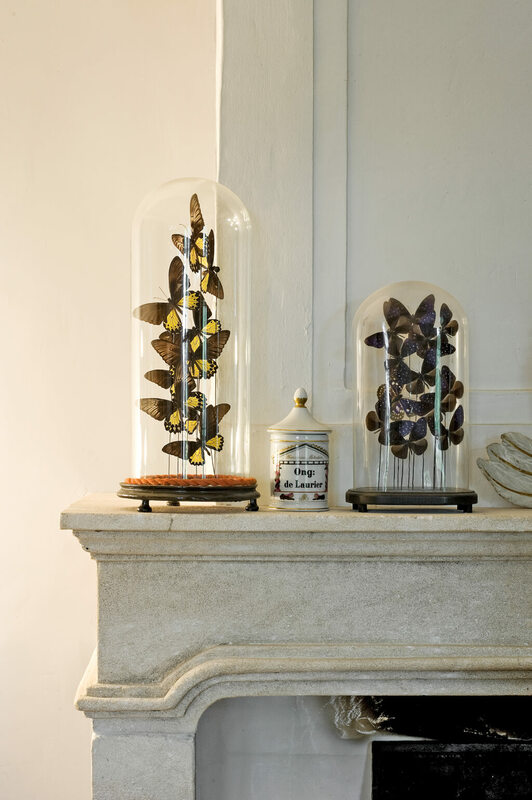 Elegant Provençal home, European farmhouse, French farmhouse, and French country design inspiration from Villa St-Saturnin. Photo: Haven In. South of France country house (a converted convent!) luxury vacation rental in the heart of Luberon National Park near Apt. Certainly lovely indeed! 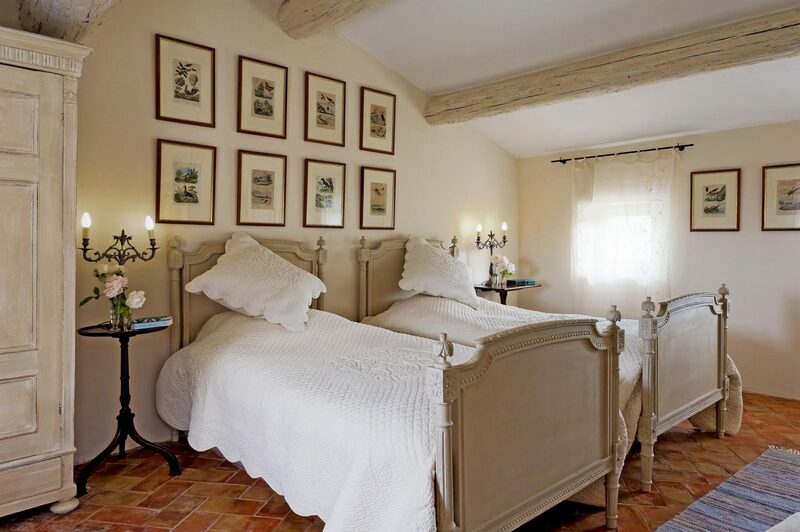 Creamy whites contrast with a terracotta tile floor in a French country bedroom. Provence Villa: Timeless & Tranquil Design. Elegant Provençal home, European farmhouse, French farmhouse, and French country design inspiration from Villa St-Saturnin. Photo: Haven In. South of France country house (a converted convent!) luxury vacation rental in the heart of Luberon National Park near Apt. Certainly lovely indeed! 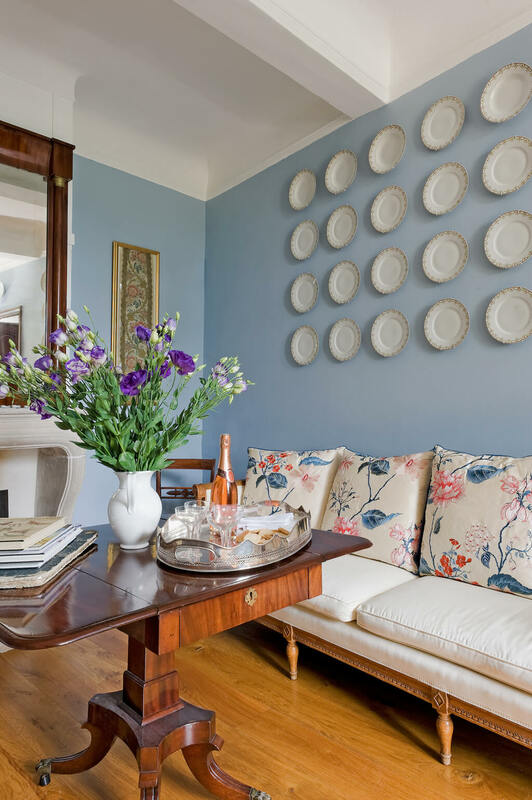 Skirted tables flank a beautiful blue bed in a French country bedroom. Provence Villa: Timeless & Tranquil Design. 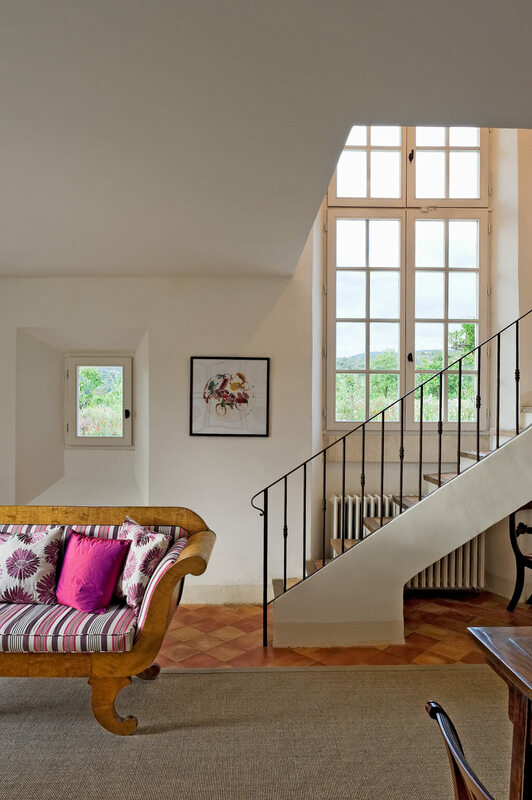 Elegant Provençal home, European farmhouse, French farmhouse, and French country design inspiration from Villa St-Saturnin. Photo: Haven In. South of France country house (a converted convent!) 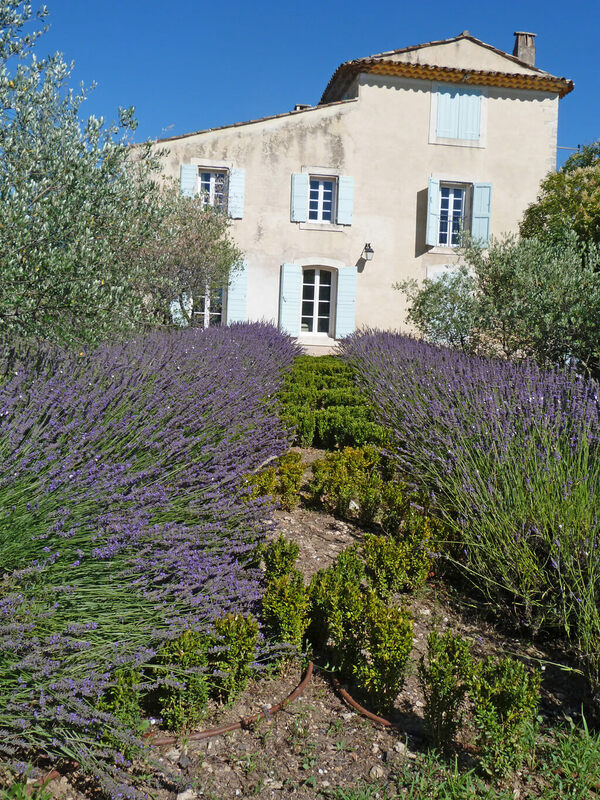 luxury vacation rental in the heart of Luberon National Park near Apt. Certainly lovely indeed! 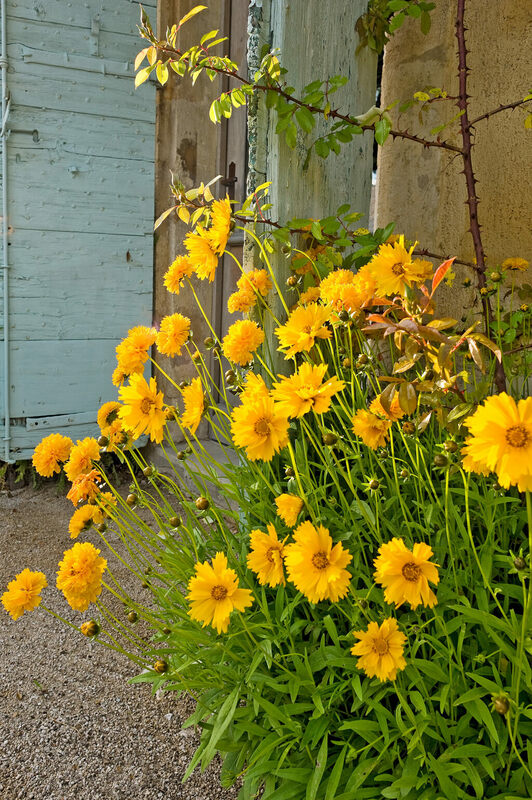 See PART TWO of our tour of more of this breathtaking villa in France! 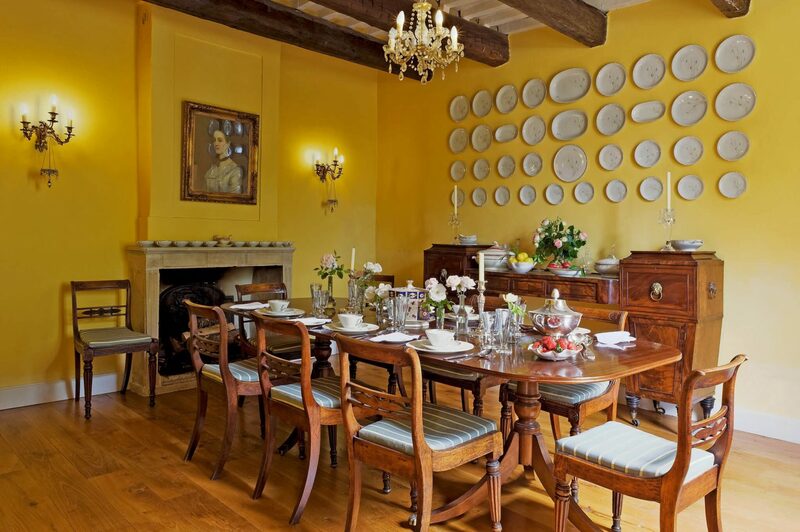 Also see THIS FRENCH COUNTRY fantasy property and THIS ONE for more inspiration. If you missed my post yesterday where I shared relief about my health crisis, SEE THIS. So glad that you now have some answers concerning your health. Just the anticipation of relief has to make you feel lifted. You are so lovely. We all want only the best for you. Loved how you wrote, “fierce grace”. So true at times. This helped me when I was dealing with a health mystery; “I can do all things through Christ who strengthens me.” You will be fine. Lovely post today. We can all swoon over the romance of a place such as this. Peace and grace to you. So happy to hear you have some answers and your spirit is lifted. I love this song by Lauren Daigle. Thanks so much for your encouragement – there’s something so pure about the message and this artist’s voice!